At the start of the New Year, many people make a resolution to better their health and eat better foods. Of course, everyone’s definition of “healthy foods” is different, so there is no right or wrong. It seems simple, but it’s not always easy. Cook from home and you will usually be eating healthier than if you were to go out to eat. A bit of salt is ok, just don’t overdo it. Most of the foods we eat already have enough salt in it anyway. Do you know how much is considered a serving? I love seafood and if I could, that’s all I would consume. I will incorporate all your 30 tips in my cooking experience. Thanks for sharing. I love seafood too! I just have to be careful because it can sometimes trigger my iodine allergy. I’m glad you found this helpful! As a former executive chef, this is one of the best posts i have read recently. the information is spot on! cook more! use quality ingredients and equipment! and use a timer! Thank you so much! It’s encouraging to hear from someone who was in the business! Cooking from home made a huge impact on my family’s health and budget! I definitely need to try cooking seasonally. Also, I need to stop eating so much cereal and make myself a veggie omelet and breakfast salad. It sounds so delicious and healthy. I know, I eat cereal a lot because it’s just so convenient. Especially on school morning when I’m trying to get breakfast for both kids and lunches made and dressed and teeth and backpacks and out the door on time!! These are really good tips! We cook seasonal as often as possible! We have this great farmers market, weekly, so its nice to have what is in season to work with! Plus its fun to look up new recipes based on that! I’m so jealous you have a weekly farmer’s market! My neighborhood just got one and it’s only once per month. I very much need an instant read thermometer! These are great tips. I struggle with using a timer, I just tend to forget. My husband is bad about the timer sometimes too. I’ve burned a few too many meals that I remember (most of the time)! I figure it’s better to under-salt because you can always add a bit later but you can’t take it back out. I wish I could get my husband and son to eat a variety of veggies and seafood! Both are a little picky, and it gets hard to change it up and eat healthy. It’s a work in progress. My boys aren’t the best at eating the veggies just yet, and I have forced myself. It’s an acquired taste, just keep offering when you can. You need to use a Cast Iron Skillet ASAP. I have both a skillet and a dutch oven. Soups and stews have not tasted as good as they have in those pots. I am not sure what it is, but it is magic. Good to know! I am adding them to my wishlist to get soon so I can try them out and see the difference! Been eating a lot healthier since last year (with a break for Christmas of course) and all of these are great tips! I’ve got a Pinterest board for delicious recipes, too. Can’t wait to get cooking! 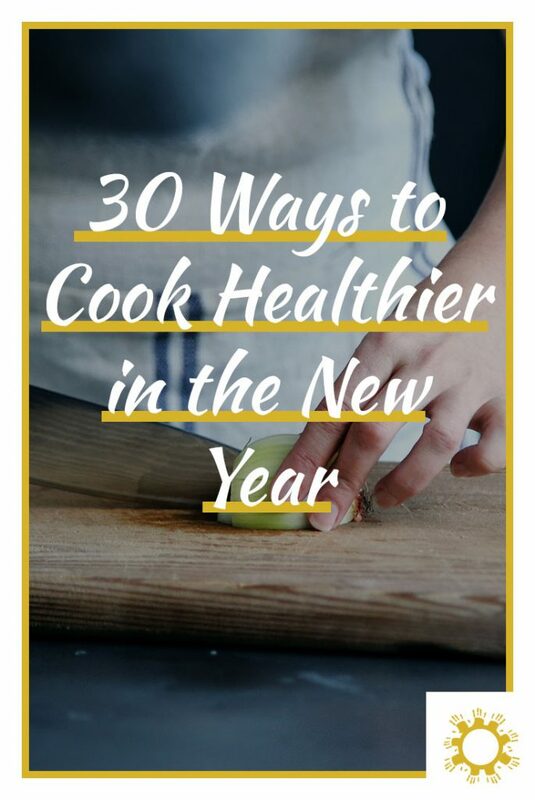 I will certainly be taking in these tips because I want to eat healthier this year! I definitely need to work on using salt more wisely! Glad they are helpful! Salt is already in so much of our food, it should be added only sparingly. That’s a great list! I’ve used an iron skillet and really liked it. When we did 100% plant based, it was a good way to get additional iron in our diet. no kidding! I’ve heard so much about them, I really need to try one soon! great tips! so true that better quality ingredients make a way better meal! eating wholesome and sustainable produce is our goal as well! I never really understood until I started being more conscious of the ingredients we buy. This is such a motivating post for the new year! Quality ingredients really go a long way. Thank you! I never knew how much the ingredients matter until I started being more careful about the foods I choose. Now that my chronic illness has improved, I’m looking for healthy ways to eat. Diet is so important when it comes to weight loss. Thank you for this. I’m glad to hear you are doing better! The food we put in our bodies makes such a difference! I love your website! One of my 2018 goals is eat healthy and release weight, but am not a fan of spending hours in the kitchen. So tips and recipes ike your sweet potatoe one are just what I need. Will be visiting your site regularly to check out recipes and healthy eating posts. Thank you! Awesome, I’m so glad you found all of this so useful! Not all of my recipes are the healthiest, but we try most of the time!